Facebook’s launch on February 4, 2004 was to become the major social media network on the Internet. 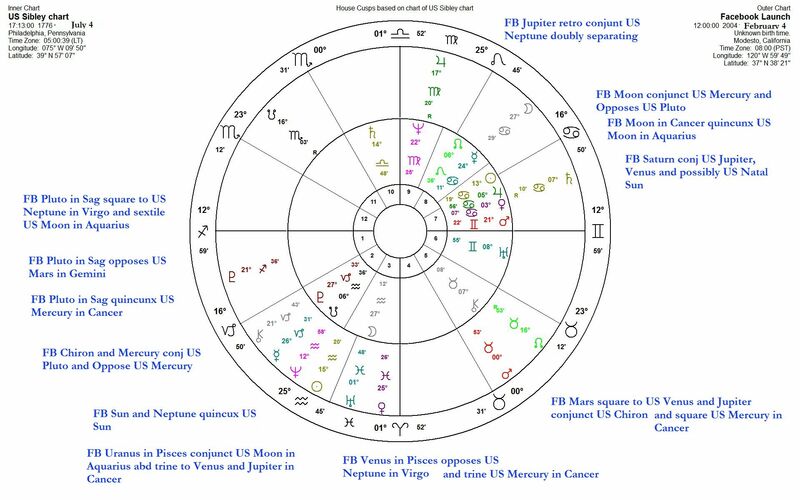 Looking at the launch from an astrological viewpoint, we notice that the planetary contacts or aspects between the Facebook launch date and the official US founding date of July 4, 1776 complement one another in a profound manner. Facebook has propelled its founders to extreme wealth while offering to everyone in the world with an Internet connection the possibility of communicating to other users worldwide. Advertisers were able to reach customers worldwide. Another facet of the phenomena of worldwide participation was the gathering and storing of data about the users and a profile of personal preferences and online contacts. 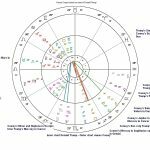 Below is the US chart, known as the Sibley chart which was rectified by Dane Rudhyar to the time of 5:13 PM Philadelphia, PN from the given time of 11PM GMT on the inner glyph and the Chart of the founding of Facebook on the outer chart. The House system used is Placidus, and the zodiac is Tropical. The threatening repartee from the dictatorial leader of North Korea, Kim Jong Un, and President of the US Donald J. Trump in the past week have suggested to the world that we may be on the brink of another war. Reactions vary however, although the personalities of the two leaders are definitely an important factor in this escalation of words and threats. While Donald Trump’s birthdate and time are well known, the N. Korean dictator’s birth records are more obscure. Various dates were given at various times, however, the record from S. Korea and that of Kim’s American friend Rodman concur that the date in 8 January 1983. So I have used that birthdate with an unknown time to calculate Kim’s natal chart. 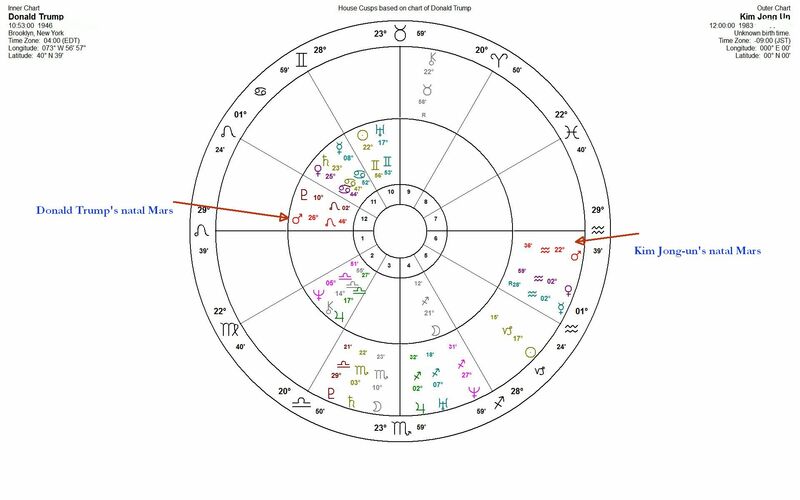 On that date in 2011, when assuming power, transiting Mars is trine to Kim Jong Un’s Natal Sun at 17 degrees of Capricorn. Transiting Sun is conjunct Kim Un’s natal Neptune with transiting Moon in Libra opposed by transiting Uranus. Kim Un has Jupiter conj Uranus natally, and transiting Mercury was conjunct Kim-un’s natal Jupiter-Uranus pair. Transiting Jupiter in Taurus was opposed to Kim-un’s natal Pluto –Saturn conjunction. While transiting Saturn was conj Kim-un’s natal Pluto approaching by 2 deg. There are many favorable indications here and also strong-arm influences, such as Transiting Jupiter in Taurus opposing natal Saturn in Scorpio and natal Pluto in Libra (an out-of-sign conjunction). At the young age of 29, Kim Jong-Un was the most powerful person in N. Korea, the heir to the Kim dynasty, with a powerful and disciplined military and a suppressed population of families and workers. The famine of 2009 resulted in thousands of deaths. Then, just two years later, the young leader took the reins of power. He has continued to build the potential for a military equipped with a nuclear bomb. Now that he has the capabilities, he threatens the US, and of course, President Trump threatens back. 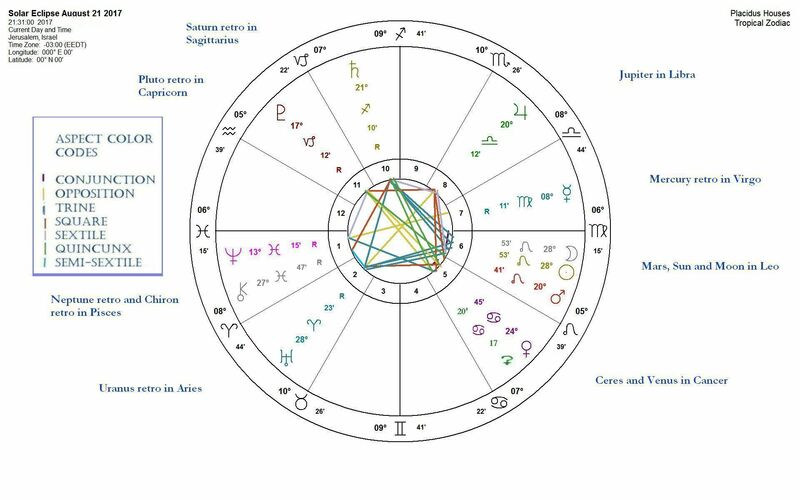 Kim Jong-Un’s chart has all planets within the trine of Mars in Aquarius and Pluto in Libra. His natal Mars is directly opposed to Trump’s natal Mars in Leo. Trump’s natal chart has all planets except the Moon within the trine of Jupiter in Libra and Uranus in Gemini. They both gained power as a result of their fathers and grandfathers positions or wealth. They are very close to mirror images of one another. Neither of them can or will stop bantering one another. Restraining forces on both sides will be left to moderating influences of a third party. Looking at the US Congress, there is Mitch McConnell as the leader of the majority in the Senate. Trump would need the consent of Congress to declare war, and has limited capabilities on his own initiative. Mitch McConnell has also raised Trump’s ire with his comments that Trump is new in a government office and does not understand how legislation takes time, in connection with the healthcare bill that did not pass by one vote.. This served as some distraction for Trump who lashed out at McConnell after his taunts to Kim Jong-un. With his approval rates slipping, starting a war would be a possible way to regain loyalty in the country. An outside enemy could bring the infighting to a close. 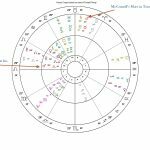 McConnell’s natal chart shows that his Mars in Taurus is square to Trumps Mars (a harsh aspect 90 deg). While Trump is engaged in a war of words, a combative tug-of-war, with not winner, McConnell and Trump are in conflict, but the power is unequal. McConnell is not likely to strike back at Trump. However, his power in the Senate is strong, and will not be diminished by Trump’s comments. There is a way for McConnell to gracefully side-track the attack. 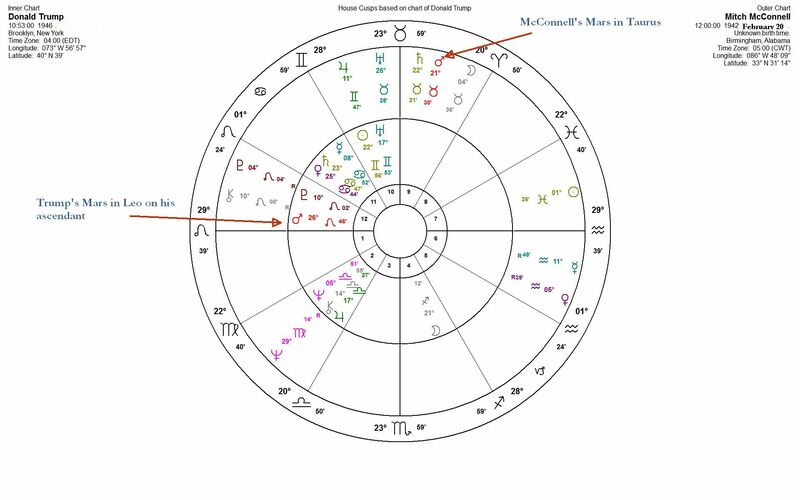 In fact, McConnell’s natal Mars stands at the focal point of the Mars to Mars opposition of the two adversaries, Trump and Jong-un. McConnell may be in a position to mediate, to intervene in the war of words and bring a more calming influence to the situation. We shall have to wait and see if that develops. Trump has opened a new possible confrontation for the US Army, a military action in Venezuela. This intervention has no precedent. Trump is intent on building up American military might as opposed to social programs. Certainly the active Mars on Trump’s ascendant would indicate direct and militaristic action. In Leo he would be boastful about his military might. If you have enjoyed reading this post you are also invited to receive the weekly astrological forecast by email, published each week on Tuesday. Please enter your email address in the form on the right column. Thank you! This eclipse will be visible in Oregon in the early morning on August 21, 2017 and with clear weather permitting, will be seen throughout its path across the US. This is the chart for the earliest sightings in Oregon on August 21. 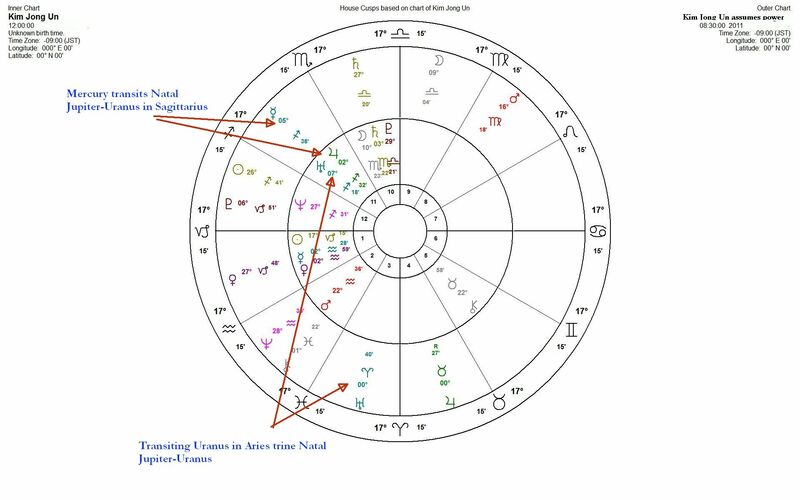 In this chart, there is a Grand-Trine in fire signs, including the Sun-Moon conjunction, trine to Uranus retrograde (an exact trine of 120 degrees angle) and a trine to Saturn retrograde in Sagittarius (a weaker aspect of about 7 1/2 degrees). The complete chart with aspects drawn is posted here. 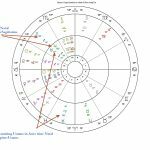 The trine aspect to volatile Uranus in Aries indicates that there will be important adjustments made, trine to Saturn retro in Sag, those adjustments will be carried out in a matter of weeks and months, as the three planets interact. Saturn turns direct just 5 days after the eclipse and helps to moderate the rather radical changes that will be made during the coming weeks and months. 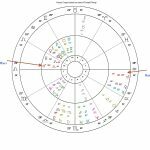 saturn and Uranus form a trine aspect on November 10, 2017. This leads up to a November election and some more modest but influential changes that will result over time. 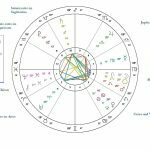 While many observers were shocked at the latest Trump move to eliminate potential political rivals, the animosity between the two can be seen easily by looking at their natal charts. If Comey was fired to divert attention away from a possible investigation of dealings of the Trump Campaign and Russian interests, or simply because of the character conflict is less easily seen in the respective birth charts. The two men, even based on appearance are quite unlikely matches. While Comey is tall and youthful in appearance, Trump is showing his age and rather rotund. While Trump with his famous stream of consciousness style, is forceful and abrupt, Comey is more measured and cautious, although he testifies with believable sincerity. Indeed the Sun in their respective birth charts are opposite one another. Other oppositions operate, as well as conjunctions between the planets in the two natal charts and at least one trine aspect. Their characters are quite diametrically opposed one to the other. Trump’s natal Mars is conjunct Comey’s Uranus. This may mean that Comey seems to be a threat to Trump, and to the direction of his goals. Coney may impede Trump in a radical way. The firing has not put an end to the animosity, as Trump seems afraid that Comey will continue to act contrary to his interests. 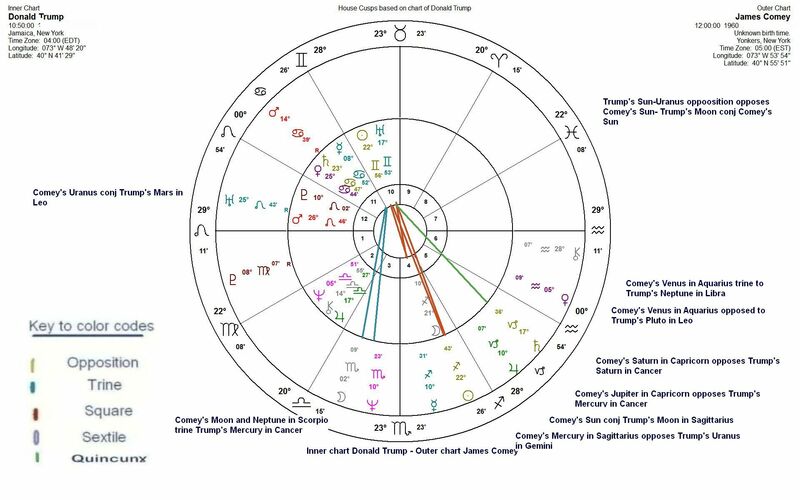 Trump’s natal Moon in Sagittarius at 21 deg is conjunct Comey’s natal Sun at 22 degrees. This is ripe for projection. Comey embodies Trump’s subconscious fears for an upset in his administration. 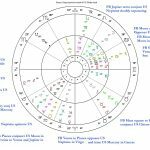 Trump’s natal Moon is opposed to his Sun–Uranus conjunction and he is likely to expose his own flaws, the very involvement that could have him removed from his position as president. Trump does have it out for Comey. It is not simply an error or a “bad Job” on Comey’s part. Comey embodies Trump’s subconscious fears. There is a lack of trust between them. Each has a trine aspect from his Mercury to the other’s Neptune, showing that while they converse (Mercury) in a fluid manner (trine aspect), there is mistrust (Neptune) on both sides. Saturn’s positions in the two charts are also opposed to one another. Trump’s Saturn in Cancer opposes Comey’s in Capricorn by 6 degrees. Certainly they have opposing world views, opposing goals and directions in government. Comey’s Saturn is exactly quincunx aspect to Trump’s natal Uranus so he is again under a seeming threat from Comey’s former office in the FBI. Comey may still have the goods on him, but not the office to prosecute. Comey may still be instrumental in Trump’s downfall. Comey’s Saturn is exactly square aspect (harsh 90 deg) to Trump’s Jupiter, so the conflicts are severe. Comey has motivation to deflate Trump’s empire and largess. At least the animosity between the two is obvious. Trump could learn a great deal from Comey while Comey could be enriched or conversely overwhelmed by Trump’s lack of legal support or balance in his display of wealth. Calling Comey a “Showboat” and a “Grandstander” just emphasizes Trump’s lack of professionalism. While Comey could be in a sense was trying to serve two masters as he made his reasoning public in the congressional investigation. Trump wants his loyalty yet he must be loyal to the country first of all. His exposure of FBI processes is also unprecedented, as he admitted. He has made public what Trump wants us to ignore. With Jupiter and Saturn in Capricorn, Mercury in Sagittarius and Neptune in Scorpio, Comey became an object for Trump’s envy and embodied his fears. With his natal Venus opposing Trump’s 12th house Pluto, Comey could in fact be an agent to undermine and implode Trump’s most unconscious, archetypal character flaws. On the other side, Trump has power over Comey’s position at the FBI. Distrust has turned to animosity as Trump is now fearful that Comey will expose his secrets. Trump’s move seemed rather impetuous, and now puts Comey outside his reach. We’ll see what happens. As transiting Saturn is now retrograde and returns to station on Trump’s natal Moon degree (also transits Comey’s natal Saturn) we could see this conflict playing out in detail, starting in July 2017. Checks and balances are at work, as investigations carry on. Check on the daily aspects posted here each week and on Facebook.